As a growing club of photography enthusiasts the Arklow Camera Club are always looking out for opportunities to increase our skills, preferably while taking pictures! Through a club contact, a morning of portrait shooting had been organised in Bray, Co.Wicklow with the help of professional photographer, Charley Sharkey. For those of you unfamiliar with Charley let me start by saying he knows his portraits! 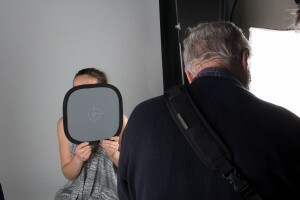 However, on the morning of the portrait shooting we learned that Charley had only recently been released from hospital so it was down to his assistant David Drysdale to oversee our portrait shooting. We had the use of a studio, someone to guide us and a band of enthusiastic amateur photographers. Now all we needed was a model or two! Shauna is currently studying makeup in college and as part of her studies she needed to show examples of her work as part of her assessment. So with Shauna requiring pictures and Arklow Camera Club seeking models it seemed like a perfect fit and it was! Luckily Owen’s stunning niece Katie was around to save the day! At this photography morning it was also decided to make the topic for the February Print of the Month competition “Portrait”. This would afford each member a good chance to submit up to a maximum of three entries. We know that the competition will be tough! It was a fantastic morning shooting portraits and our thanks go to Charley Sharkey, David Drysdale, Katie (the make-up artist) and Shauna (the model) without whom our portrait photography morning would not have been possible. Thanks again guys, from all of the members of The Arklow Camera Club!